Born in Omaha Nebraska in 1937, Edward Ruscha showed an interest in art at a young age. He moved to Los Angeles in 1956, enrolling in commercial art and animation classes at the Chouinard Art Institute (now the California Institute of Arts). He soon became interested in the fine arts, however, and began taking painting, drawing and watercolor classes. Although his art school advocated Abstract Expressionism as the most modern and advanced artistic movement, he was more attracted to readable, popular references. In 1957, Ruscha saw a reproduction of Jasper Johns' Target with Four Faces and Robert Rauschenberg's combine painting in Print Magazine. He described how he "knew from then on that I was going to be a fine artist … The work of Johns and Rauschenberg marked a departure in the sense that their work was premeditated, and Abstract Expressionism was not … So I began to move towards things that had more of a premeditation … I felt a kinship with Andy Warhol and Roy Lichtenstein because it was a logical departure from the kind of painting that was happening at the time." At this time there was a general shift from the gestural abstraction of the Abstract Expressionists to imagery drawn from popular, commercial culture. This shift was occurring simultaneously in Los Angeles and New York. 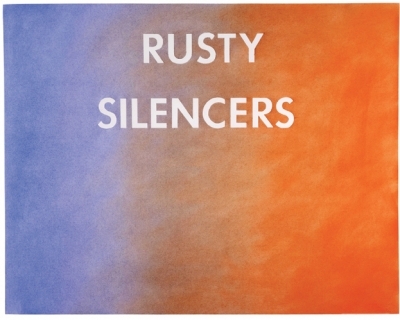 Like the other Pop artists, Ruscha drew inspiration from blurring the boundary between fine art and popular culture. His flat, brightly colored aesthetic recalls the catchy visual language of advertisements, and his bold, iconic use of text bring to mind brand logos. Ruscha held his first one man show at the Ferus Gallery in Los Angeles in 1963, where both Warhol and Lichtenstein exhibited in the early 1960s. 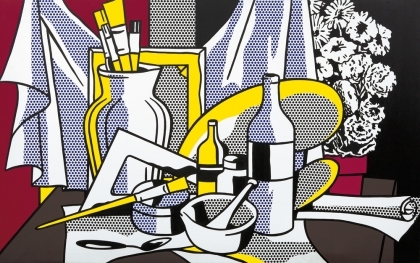 He was also included in the first show to assemble Pop artists, "New Painting of Common Objects" at the Pasadena Art Museum in 1962, alongside artists such as Roy Lichtenstein, Andy Warhol, Jim Dine and Wayne Thiebaud. In the following year, he was part of the "Pop USA" show held at the Oakland Art Museum in 1963, one of the first Pop exhibitions in America. Ruscha was particularly interested in typography and the concept of the word as art, painting prominently written words and logos in his paintings and occasionally juxtaposing the text with images. Throughout the early 1960s Ruscha played with various typographic styles, which he explored more exclusively later in his career. 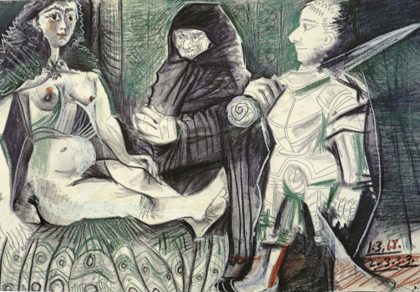 He liked to experiment with the expressive qualities of text, and often focused his paintings on one word. He explained his fascination with text, "I love the language. Words have temperatures to me. When they reach a certain point and become hot words, then they appeal to me."